Precious is just about the only description you need for this ring from Apples of Gold jewelry collection. Devised from the ever-bright .925 sterling silver, this 7mm band is a gleaming example of artistry. Two polished edges encompass the ring and make way for the excellent detail work inside. Dual four-petaled flowers are in perfect bloom in this design, and sit under two sweeping lines that create a �V� shape and end in intricate curls. To complete the look, a full heart holds a white diamond and creates a priceless treasure. Made with tarnish-resistant argentium sterling silver. 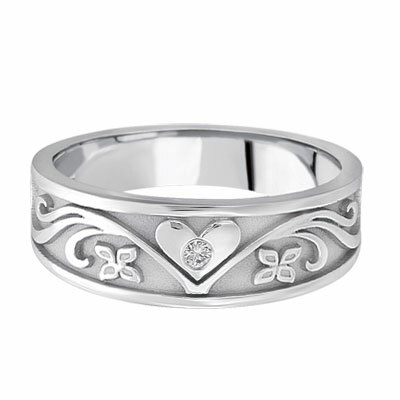 We guarantee our Silver Heart Diamond Floral Wedding Band to be high quality, authentic jewelry, as described above.